. . . mutual politeness which keeps the peace in an insecure and insincere state of society. But that old blackened wooden sign is at least and after all the sign of something; the sign of the time when one solitary Hohenzollern did not only set fire to fields and cities, but did truly set on fire the minds of men, even though it were fire from hell. Lots of interesting history that I know little about since it's mostly about the events leading up to and the very beginnings of the First World War. It's delightfully written. The subject matter is both dated and frozen in time to mid-World War I. For that reason, it's both anachronistic and from a great perspective (for history buffs). Chesterton's writing is nimble, clever, and intelligent, making it worth a read for lovers of writing. Despite the many valid and poignant points that G.K. Chesterton makes, it's quite ludicrous that while blaming Germany for their crimes to admit that England is not blameless; yet blame England's guilt on the Germans who infested England, i.e. King George and his ilk. Don't go to Chesterton to get facts or history; go to him to get a lens to look at history. His books are merely his glasses. He's always got an opinion, and somehow it always rhymes or alliterates with some common phrase, which then turns out to be the opposite of what you thought it was. It's really just a war-time essay trying to villify enemy. Chesterton is very talanted annd witty and it's funny how he uses words like "heathens", "herecy" and alike. But nobody should honestly beleive that WWI was German's fault and other countries were "dragged" into it. G.K. Chesterton is generally at his weakest in political polemic: His most difficult books to wade through are such titles as The Appetite of Tyranny, The Utopia of usurers, and The Barbarism of Berlin. 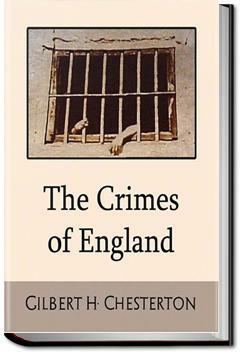 Fortunately, The Crimes of England is among his better polemical works.